I'm happy to introduce you to Nicole Docimo, an artist and blogger living in Davis, California. On her blog, Blue Bicicletta: Art and Illustration, Nicole writes engagingly about the joys and hardships of being a full-time artist. Nicole's art work is simple and whimsical, and often encourages the viewer to celebrate life's small pleasures, like stopping to smell the roses. I have gotten to know Nicole through email exchanges and think she's not only a talented artist but also a lovely person. Indeed, Nicole has generously offered one lucky Food Blogga reader one of her eco-friendly reusable tote bags with the motto: Eat Well and Slowly (pictured below). 1. Your art work is simple yet playful and appealing. How did you develop your style? My style developed by a series of happy accidents and a weaving together of various interests. A few years ago, when I was getting back into visual art after a long sabbatical, I was really trying anything---collage, painting, block printing. Then one day, my then boyfriend, now husband, noticed that I was always doodling with just a pen on paper, and he said, "Why don't you do that type of drawing more seriously?" At that moment the light bulb went on, and so I started taking my black pen to larger pieces of paper. At first, I was doing more abstract, pattern-based drawings, but I had also been making large paintings of words that came from my love of poetry and my interest in making poetry more visual. At about the same time, I was taking some graphic design courses and getting excited about typography and design, and then I signed up for an art show/project called "The Sketchbook Project" through the Art House (http://www.arthousecoop.com/) in Atlanta, GA, where 500 artists were each sent a small sketchbook to illustrate under the theme "How to Save the World." That project really launched me into my current style, as I tried to bring simple drawings and messages together to illustrate several ways to "Save the world one person at a time," including things like "Eat Well & Slowly," "Ride Bikes," and "Value Your Time More than Your Money." These drawings have become some of my most popular, and really were the gateway to what is now Blue Bicicletta. 2. An artist's life can be challenging in many ways. How do you stay motivated during slumps? I think the most challenging thing about being an artist is mental. It's a challenge to push through all of the ideas that are tossed around in society as a whole (and that live in my own mind) about how difficult it is to make a living as an artist. One of the most important things I've learned is that I can do the work, no matter how I feel. I think a lot of people think that artists are always dancing around and feeling inspired, but I don't think that's true in most cases. I think that in order to have a creative career, or just a life in some creative art, you just need to keep showing up, no matter how you feel. Once I realized that I could do my work even when I was not feeling inspired, or at least I could show up and try, that took some of the pressure off, and it became more about just making time for the work and continuing. I also think that the more art you make, the more ideas you have---so it follows that the more you "show up" the easier it gets to show up. 3. What are some of your goals for the next year? My main business goal for the next year is to keep trying to figure out what combination of things will create and maintain a full-time income for me as an artist. My main personal goals are to continue to learn how to appreciate every day, and be patient with myself. 4. What tips can you offer to bloggers to stay fresh and be creative? Blog about what you really love and are passionate about. I know people always say this, but I think this is true across the board in life: if you do the things you really love, that really excite you, there's no way to lose: people will see and feel that excitement and get excited too, you will more easily be able to maintain your energy because you love what you're working on, and in general, you will get to feel all of the good feelings that come along with doing something you're passionate about. Passion is never boring for the maker or the viewer. 5. How did you come up with the name of your blog, and when did you launch it? When I was trying to think of a name for my blog, I knew I wanted a name that conveyed a sense of me. I live in Davis, California, a town that is known for its huge percentage of bike riders, and I love to ride my bike. I am also half Italian, so the word "bicicicletta" (the Italian word for bicycle) seemed like a good fit. Also, I love the color blue, and the word "Blue" had a nice sound with "Bicicletta." So, all of these things just fit together into a creative, playful, fun name. I also like to say that making art feels like riding my bike fast, down hills. So, there you go. I launched my blog in the Fall of 2007 as a way to explore art and share my art with other people, and I haven't looked back. I love blogging---it's such a fun way to share my art and creative process. To see more of Nicole's work and/or make a purchase visit her Etsy site. She has over 150 items for sale, many that are perfect for the foodies on your Christmas list. Now for the give-away! To enter for a chance to win this nifty reusable tote-bag, simply leave a comment or question below pertaining to Nicole's art work by the end of the day, Thursday, December 17th. The winner must provide his or her full name and mailing address. As an extra bonus, if you have submitted a cookie to our Eat Christmas Cookies event, or do so by the 17th, you will double your chances of winning the tote bag. Good luck! Congratulations to last week's winners! Manju of Three Tastes, has won a copy of the cookbook, Vegan Cookies Invade Your Cookie Jar. Alta of Tasty Eats at Home has won the Fresh and Easy holiday wine and chocolates. Please email me your name and address so you can receive your prizes. I love that. Eat well and slowly. the ultimate unattainable goal for me. ha! The beehive design is adorable!! I love the artwork on these bags! They are so adorable, as well as useful! I love the Pomegranate one! It's so cute! Such fun bags and practical too. I love all of the designs. Beautiful work! Looks like a nice sturdy bag for groceries and library books! These are awesome. Do you enjoy cooking or baking too or what inspired the foodie type bags? oh, this bag is really cute! i love her work. I love the simplicity of the designs! i love the 'eat well and slowly' bag! Very cool artwork. Tote bags are so popular now. I have a big stack that I take with me to the grocery store. I love the pomegranate one. Love the look and the simplicity! Hope I'm a winner! Art and food consciousness... we're on a higher plane! Now, fill it up with those ginger truffles and we'll be all set. I really like how simple the designs are, but they still make a statement. I love her style! I love bags too. ;) And cookies, although I've been procrastinating lately, too much else to do, no time to bake! I'll have to remedy that very soon. 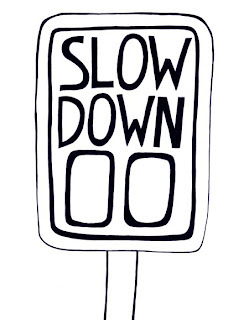 I love the "eat well slowly" design. Good job! Eat well and slowly - It's beautiful and the perfect New Year's resolution. Stunning and fun work! Those are awesome little totes. I think I am developing a fascination (or obsession!) with tote bags. I need to get a few more to be able to carry all of my groceries home in them. Love all the tote designs. They are so usefull too. Love the artwork, simple & cute. Well and slowly, I need to concentrate on the slowly portion of this sentence on the bag... Nicole's artwork is so beautiful! And her blog is so good! Thanks Susan! I love Nicole's work. Her art is so simple, yet so detailed. The pictures of produce make me smile every time. Awesome bag, too! I love how simple and clean her art is. Great interview! Nicole has definitely inspired me...Love the Beehive! Simple concepts but monumental messages. These bags are wonderful! I have a question - do you tend to doodle an idea and then come back to it and redraw it and develop it until you create the final artwork or is each design/ idea created by instinct, once only? Would love to win one of your bags! Honey is my favorite condiment. I love it so much I put it on almost everything, even pizza! The Beehive tote is so lovely!!! Like Nicole, I'm a fan of typography and poetry. It was the lettering that first attracted me to Nicole's artwork, which I found by browsing Etsy. From there, I "discovered" her blog, which I now read regularly. There aren't a whole lot of artists out there reading and discussing poetry on their blogs, but Nicole is, which is a treat. I do love her tote, and am keeping all fingers and toes crossed. Thanks for introducing us to Nicole's whimsical art. We still have some gifts to get and these look perfect. And I'm thrilled to have won the vegan cookie book. Perfect timing too as I learned today that one of my colleagues is a vegetarian--I learned this as I was passing out bacon chocolate chip cookies in the kitchen! oops! I really admire artists who can draw like this. It is truly a wonderful talent. I love your artwork, especially "Eat Well and Slowly"...simple and beautiful! The bags look cute and practical. The simple designs really speak to me... I love that they convey such wonderful messages. Artist made bags---what a treat! They are wonderful! Wonderful bags! What inspires her designs the most? LOVE Nicole's artwork. It's like a gastronomical Edward Gorey. Great designs, and a sustainable practice. I hope the trend will keep going, and everyone will switch to the reusable shopping totes instead of all the plastic bags. I love graphics and typography and it is one of the things I have struggled to incorporate into my blog, with my limited tech skills. Good interview, Susan, and good post. The artist, Nicole, inspires me. Great art work on the bags, very stylish and useful. Her work is very cute- my favorite has to be the "stop and smell the roses" illustration. That's a nice message to read first thing in the morning. I love her art! So cute and simple. :) And thanks for picking me for the winner! Woohoo! I like the attention given to single veggies. so often veggies are overlooked. 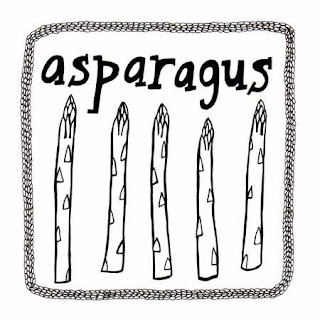 love the asparagus would make a cute rubber stamp. 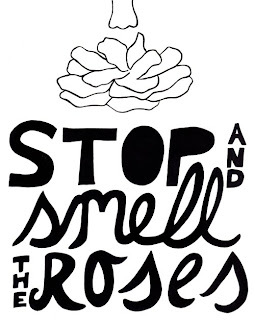 The stop and smell the roses is my favorite. Her art makes me smile. How beautiful her art is...I love it! Sorry I missed your event Susan. May I submit an earlier cookie? Cloth tote bags and all things illustrated are my weakness. Two for one here and still some people on my shopping list! Love her style. I love the bags and the graphics. Simple, whimsical, fun. And always interesting to hear about an artist's process. Wow, I absolutely love all of the designs with the food on them... particularly the asparagus. Adorable. Cute bags- love the illustrations! Oh my, I love them all! Awesome work, so cool, really love it! What an inspiring story. Sometimes in my career, I get frusterated when I try really hard and can't always see the light at the end of the tunnel. But I have faith that my passion of educating people on healthy living and being will pay off. My husband is always telling me to just relish the day to day successes. Your story about how it all started for you is inspiring and gives me courage to stay with my passion! Love these bags! Would make great holiday gifts!! Hello everyone! Thanks so much for all of your great and encouraging comments! I am so glad that my art speaks to you. Also, I'm glad you like my tote bag! One thing I would like to clarify is that I sell most of these designs as artwork, plain and simple (digital prints and originals). 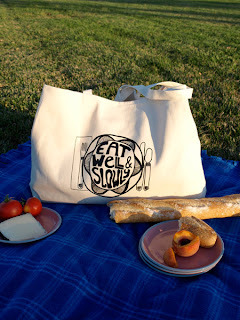 As far as tote bags, currently I have just the "Eat Well & Slowly" design, but all of your excitement for totes has gotten me excited about creating more tote bags, so stay tuned! JenB asked if I also like cooking and baking and what inspired this bag---I do love cooking and baking, just as much as I love art. I come from a very foodie family---my parents are in the restaurant business--my dad's a cook, my mom bakes, and I'm half Italian so I have always loved cooking, baking, and eating. Food in general is a really big part of my life---that love definitely inspired these drawings. Kavey asked about my process---if I develop my designs over different drawings and doodles or if I just draw my designs once. I work differently depending on the piece. With simple line drawings like this, I usually do some pre-drawings to fully develop where things will go, and then I draw a larger drawing in pencil, and then start inking it. With other more pattern-based drawings, I might just put my pen to paper and see what happens, but with drawings like this where every line counts, I do more prep. GF Gidget asked--what inspires my designs? I'm inspired by so many things, but all of them can be summed up with the idea of the magic in the mundane or every day. I like to draw things we often see, but maybe don't really see, in a fresh or interesting way. A lot of my work is about how I can represent something in a simple but interesting way that still conjures the thing for the viewer. That's what inspired my nature and vegetable drawings---seeing the pattern in the thing and trying to find a unique way to represent it. I'm also very inspired by words, letters, and the alphabet and those more literary interests inspire my hand lettering/typography. Thanks so much for all of your positively wonderful comments! I can't wait to keep reading them, and I'm so excited to find out who wins the giveaway! What fabulous bags! Conversation starters for sure at the market! 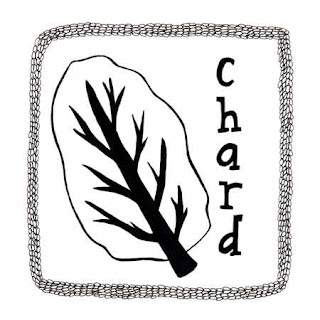 I'm curious -- does she create her artwork from drawings or other renditions of an object [for example, the beehive or chard leaf], OR does she sit down in front of those objects and create from physical observation? I love that she focuses on staking things slow...reminds me to stop and enjoy each moment! Hi Heather/Squirrelbread! In answer to your question: Do I create my drawings from the actual object in real life or from other renditions? The answer is both. If I can draw from life, I prefer it, but often it's not possible---either I don't have the object at hand or it would be tricky to get (in the case of a nest or beehive). 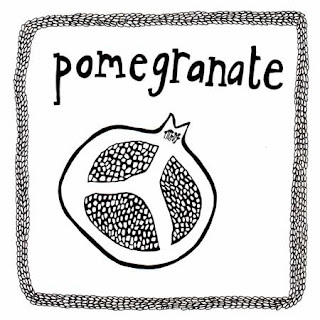 But drawings I did like the pomegranate or chard, I'm going from real life plus what I've got in my head as defining characteristics of the object, and I also like to check out photos online to get more views. With the beehive though, I actually learned a bit about beehives when researching for the drawing--basically that the stereotypical image is a version of a manmade beehive. I love learning little things like that! Thanks so much for your question! What beautiful art and I love the name of her blog. Blue Bicicletta does sound really nice. I'm going to pop on over to her blog, but hopefully I can sneak in under the deadline to get another chance to win the tote bag. It's so cute!